It is replaced by the PSC VS800. The VS1000 is a "true vertical" scanner. Aggressive, fast, and accurate it has a large, symmetrical scan volume with a generous "sweet spot" to maximize productivity and ergonomics. Each VS1000 ships with one user's guide. Maximum Productivity Wherever Vertical Scanning Is Required When choosing a vertical scanner for your retail application, you can't afford to settle for the limitations of a "one size fits all" solution. That's why the VS1200 & VS1000 from PSC are designed specifcally to optimize performance in vertical applications. Unlike many other so-called vertical scanners which are little more than horizontal scanners turned on their sides, the competitively priced VS1200 and VS1000 are "true vertical" scanners. Aggressive, fast, and accurate each has a large, symmetrical scan volume with a generous "sweet spot" to maximize productivity and ergonomics. All VS models boast a small footprint and are easily installed onto any countertop with a simple stationary or flexible stand mount. Models For The Codes You Read... The VS1200 and the VS1000 are each available in two formats. To select the VS scanner that's right for your application, first determine the codes that you will need to read in your environment. The VS1200 comes standard with UPC/EAN/JAN decoding and advanced Edge software for reading torn or disfigured labels. With Edge disabled, the VS1000 reads the UPC family plus one additional industrial code, and reads poorly-printed labels with the help of Adaptive software. Optionally, the VS1200 can be ordered with P2/P5 add-ons. Adaptive software is standard on the VS1000 , which auto-discriminates between up to four codes including UPC/EAN/JAN with P2/P5 add-ons, and industrial symbologies such as ITF, Code 128, and Code 39. ...And How You Read Them Examine your scanning environment —the VS model you choose will depend on available counter space, the method used to scan items, and the rate at which items must be scanned. 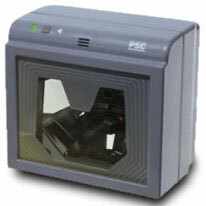 Both the VS1200 and the VS1000 are available in "Sweep" and "Presentation-style" scanning models. In higher volume checkout environments with sufficient room for a left-to-right or right-to-left scanning motion, choose a sweep configuration. In lower volume scanning environments with limited counter space, the presentation configurations' deep, dense scan pattern will provide optimal performance. The VS1000: Optimized For Your Application Your scanning requirements are unique, and your scanner should be too. With the VS1200 & VS1000 , you can have an affordable vertical scanner that's just right for your environ- ment —without sacrificing performance, ergonomics or valuable counter space. Read height: 11.5 cm /4.5"
The VS1200 reads the UPC code family with Edge decoding sosftware. When the VS1200 is programmed to read one additional industrial code, Adaptive decoding software replaced Edge. The VS1000 reads up to three industrial codes in addition to the UPC code family, and uses Adaptive decoding software. The optional integrated antenna works with Checkpoint Counterpoint IV, V and subsequent models (available from Checkpoint Systems).